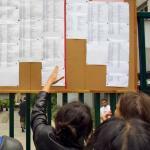 The results for the Baccalaureat are now out. Despite a 98.5 % pass rate after second-stage orals, the Lycée Français Charles de Gaulle in London did not reach the same near perfect result as last year when 99.2 % of students passed their baccalaureat. Neverthless, slightly more than 7 out of 10 entrants received a “good" or a “very good“ distinction, compared to “only" 67% last year. All the Lycée Charles de Gaulle’s students who received the top distinction were, as usual, invited to attend a reception organised by Banque Transatlantique at the Ambassador's residence in Kensington to receive their diplomas. The national results were out last Friday and showed an 80.2 % success rate before second-stage orals, which again is less than last year but more than it was in 2012 (79%). As many as 7% of candidates can still get through if successful at the oral re-test. Both in London and in France results are not as good in 2014 as they were in 2013 but still better than the overall trend of the last few years. However they have been many students criticizing the difficulty of the tests in the last few weeks, as we explained in a previous article.